On the second day we traveled out into the forest, onto a privately owned tract of land where Northwest Hardwoods was harvesting maple, cherry, and ash trees. The timber crew that we observed was a three-man operation, which is a typical size, two of which were father and son. 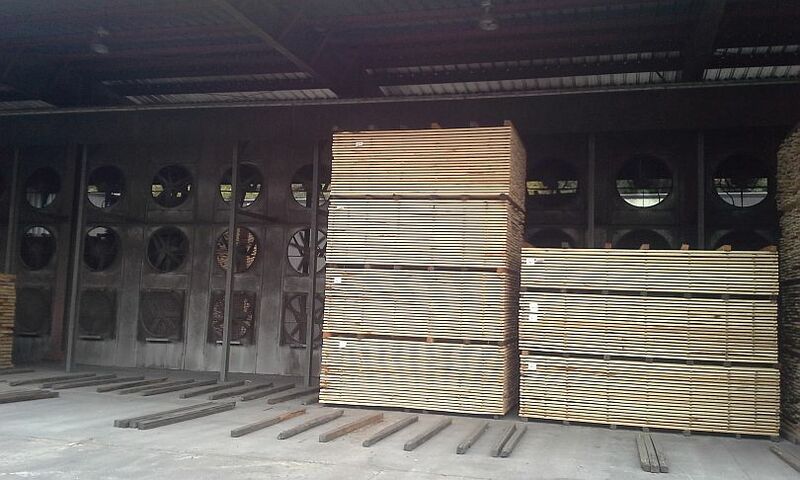 Northwest Hardwoods subcontracts out all of its timber harvesting operations to a few dozen small outfits throughout the Pennsylvania and West Virginia region. 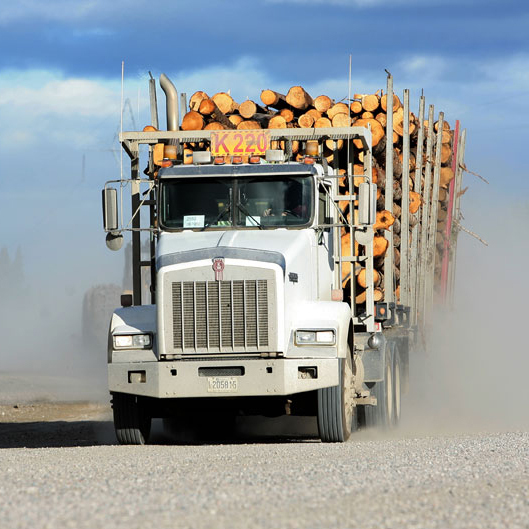 The crews work all year long, except during the wettest weeks in the spring, when the ground is to wet to drive the heavy machinery through the forest. 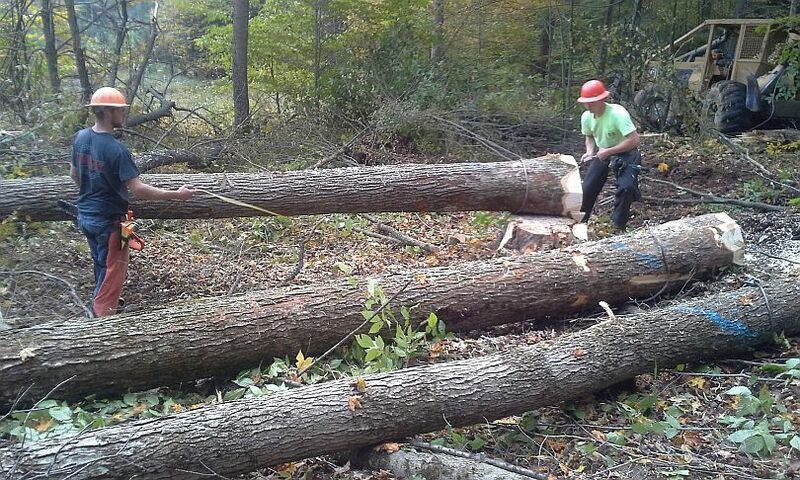 Out of the two dozen crews working for NH, the majority use fairly simple equipment, chain saws and a grapple skidder, to harvest the trees, but a few have invested in the newer automated tree harvesting machines. The automated tree harvesting machine is a double edged sword, though. It is very safe for the sawyer, and much quicker than manual cutting, but the amount of stress inflicted on the wood fibers by the clamping jaws as it is gently lowered to the ground can damage the log, so the veneer grade trees are cut by hand and allowed to fall via gravity, which seems more violent, but is actually less stressful on the tree. Last October I was invited to join my lumber supplier, Intermountain Wood Products, on a tour of four lumber mills in the northwest region of Pennsylvania. The sawyers begin by cutting down 3-4 trees in the same area. They then de-limb the upper section and cut off the unusable top portion. 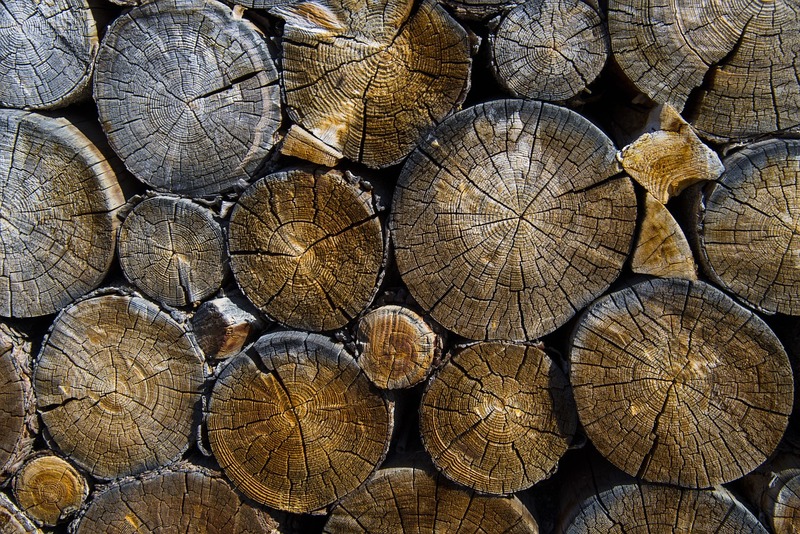 The logs are then marked in 8′, 10′, 12′, or 16′ increments, taking into account the overall grade of the tree to ensure each length is of the highest grade possible. To a newbie such as myself, this task was impossible to understand, as the trunks of each tree looked exactly the same. The trees are then lashed together with a steel cable and the grapple skidder drags them through the forest to the main clearing, where they are cut into the respective lengths. The sawyers use a technique called directional felling to determine where the tree will land, which makes their job safer and allows them to land a tree in a way that will aid in the removal process. During a demonstration of this directional felling technique, the sawyer was able to drop a 60′ tall tree in the 6′ space between two saplings! 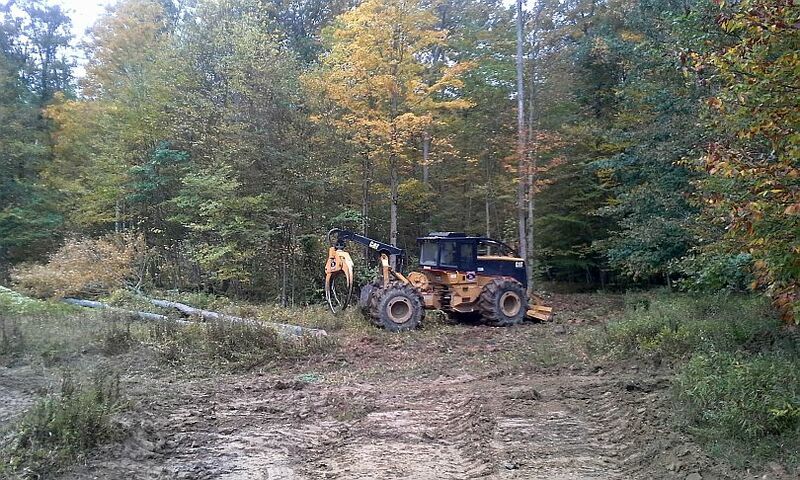 The forest gets quite trashed during this process, with the trees and the grapple skidder crushing everything in their path. But within a year, the forest floor and undergrowth will reclaimed the destruction and one would be hard pressed to even know the area was logged, short of all the stumps sticking out of the ground. All trees are divided into one of two varieties: shade tolerant or shade intolerant. Shade intolerant trees include cherry, ash, and soft maple, which means, after a a forest is logged, these species will begin to spring up and will thrive in the bright sunlight. After a few years, shade tolerant trees, such as hard maple, will begin to grow under the existing canopy. Trees in the forest grow perfectly vertical, with no branches except at the very top. They are completely opposite of the classic tree shape we are used to because there is not enough sunlight down low to support branch growth. As the tree grows taller and taller, the lower branches die and fall off. It takes the tree about 30 years to mature and reach full height. BTW, in case you are worried about the overharvesting of our forests, we were told that, at least in the case of Cherry, the trees grow at a rate that exceeds our appetite and/or our ability to harvest them. Too bad that wasn’t the case for Walnut! In the next installment, I will talk about the economics of timber, from the viewpoint of the sawyers and the lumber company, and we will look at how whiskey has radically changed the oak market.